Continuing the theme of delicious autumn foods, here are some lovely Pumpkin Scones with pumpkin spice icing. The spices bring in all the flavors of fall – cinnamon, nutmeg, ginger, cloves – and real pumpkin rounds them out as a perfect fall breakfast or dessert. These are fluffy on the inside with a nice crunch on the outside and gooey sweet icing. I found the idea for these on Pinterest, from the How To Simplify blog. Boy do they hit the spot! As it gets colder outside, I want more and more to enjoy oven baked goodies, and homemade ones are the best. Since coming to Indiana, I’ve discovered that fall is my new favorite season, and I am embracing all things fall. Pretty much every time I go to the store I buy a pumpkin or several, or a bunch of winter squash. Let’s just say it is a good thing these double as home decor. Hopefully I can eat all of them before they go bad. Fortunately there are a lot of amazing recipes out there for pumpkins, with or without pumpkin spice. Want to use a real pumpkin too? The little pie pumpkins are excellent for this and surprisingly easy. Snap the stem off first. Cut the pumpkin in half. The easiest tool to cut a pumpkin in half? A pumpkin carver, of course! If you want the seeds for eating, clean them out now; otherwise after cooking is fine. Put the two halves cut side down on a foil-covered cookie sheet in a 350 degree oven for 30-40 minutes or until it’s soft. Let it cool, then scoop the pumpkin out of the peel/shell and mash with a fork (throw out the peel). You now have pumpkin puree! Other winter squash could be substituted if that’s what you have handy. You can make your own homemade Pumpkin Pie Spice blend too. The recipe for this is very flexible so adjust it to your tastes. In general, use 4 tsp ground cinnamon, and 1/2 tsp to 1 tsp of the following: ground ginger, ground nutmeg, ground cloves. Allspice, cardamom, or mace can be used in place of the cloves. 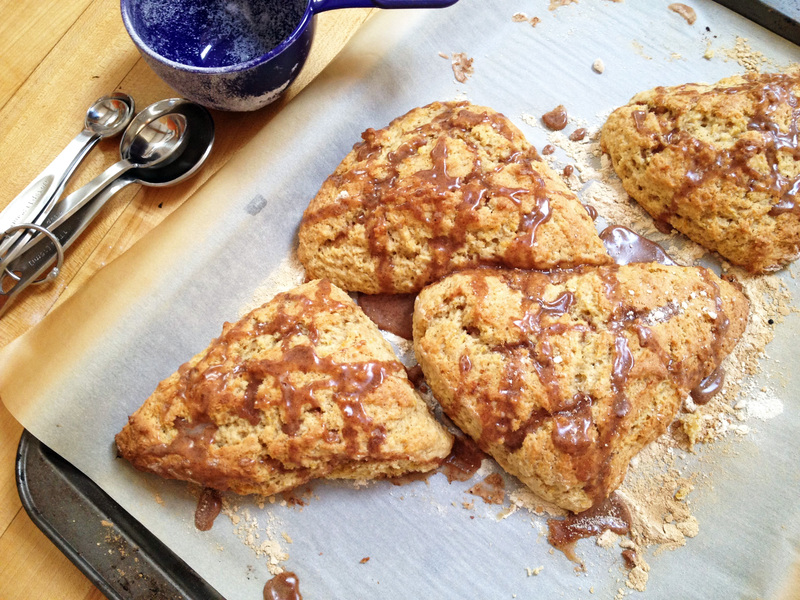 Warm fluffy pumpkin scones, full of autumn flavors and pumpkin spice goodness with sweet icing. Preheat oven to 425 degrees. Spray a baking sheet with cooking spray or line the baking sheet with parchment paper. Whisk together the flour, sugar, baking powder, salt, cinnamon, nutmeg, cloves, and ginger in a large bowl. Whisk together the pumpkin, half and half, and egg in a separate bowl. Carefully mix the wet ingredients into the dry ingredients. The dough will be very wet and sticky. Place the dough onto the prepared baking sheet and form the mixture into a long thin rectangle (approximately 9x3 inch rectangle). Use a knife or pizza cutter and slice the dough twice through the width so that the dough is in thirds. Slice each rectangle diagonally so that you have six triangles. Pull apart the triangles so that you leave at least an inch between each one. Bake 14-16 minutes or until a toothpick inserted in the middle comes out clean. Make the icing while scones are baking: Combine the icing ingredients in a small bowl and stir to combine. Drizzle the icing over the warm scones. This entry was posted in Breads, Brunch, Desserts and tagged dessert, fall.